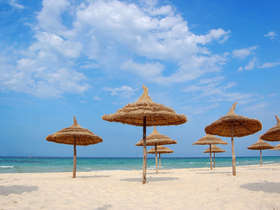 With one foot on the Mediterranean and the other set in the Sahara; Tunisia’s attractions are diverse and range from striking Roman ruins, to lovely old medinas, glorious beaches, and never-ending rippling sands. 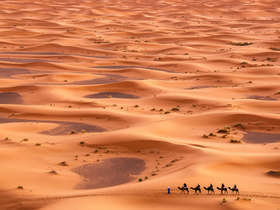 With such a range of opportunities the question as to where to travel in Tunisia is far from straight forward. Corinthian’s destination guides and suggested itineraries are a good starting point, but we would encourage you to take advantage of our tailor-made holidays service. With their vast accumulated knowledge, and years of experience in designing luxury holidays in Tunisia, our destination specialists will ensure that your holiday experience is seamless from the moment you contact us. 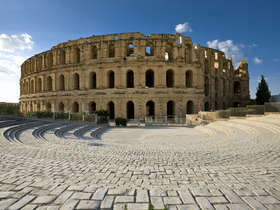 Kairouan is revered as the fourth most important holy city in the Muslim world behind only Mecca, Medina and Jerusalem. 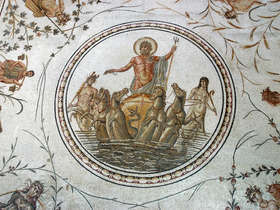 The city is Tunisia’s spiritual centre and has been designated as a UNESCO World Heritage Site. 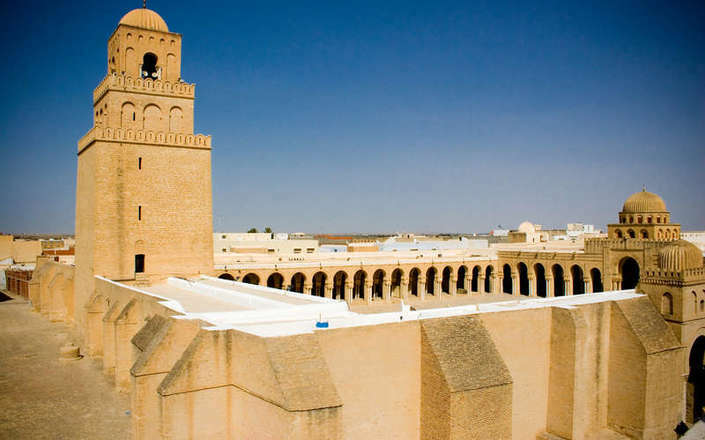 Kairouan’s foundation dates back to 670 AD when the Arab general Okba Ibn Nafi halted here, and as a result of divine revelation, designated the site as a holy place. As capital of the Aghlabid empire in the 9th century Kairouan became one of the world’s great cities. During this period only the town’s reputation for scholarship outshone its glorious buildings. Preeminent amongst the city’s monuments is the Great Mosque of Okba, one of the largest and oldest mosques in the country. Its exterior is dominated by fortress like walls and a towering square minaret, while the interior features an enormous central courtyard graced by 611 beautiful re-used Byzantine and Roman columns. A walking tour is the best way to appreciate Kairouan’s attractive medina and souqs and to see the city’s craftsmen at work. At the Bir Batouta a decorated camel draws water from a well which some say is that found by Okba Ibn Nafi in 670 and is connected with the well of Zam Zam in Mecca. Nearby, the Mosque of the Three Doors is noted for its elaborate external decoration. 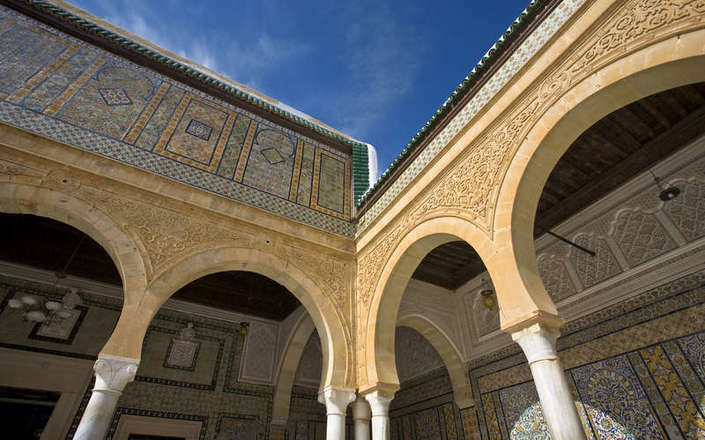 Located outside the city’s 8th century walls are the large reservoir-like Aghlabid pools which were intended to reduce Kairouan’s summer heat, and the lively Mosque of the Barber (also known as the Zaouia of Sidi Sahab). This ‘Barber’ a companion of the Prophet who distinguished himself by always carrying three hairs of the Prophet’s beard on his person. A walking tour is the best way to appreciate Kairouan’s attractive medina and to see the city’s craftsmen at work. One of the largest and oldest mosques in the country with an exterior is dominated by fortress like walls. This lively mosque honurs a companion of the Prophet who always carried three hairs of the Prophet’s beard. 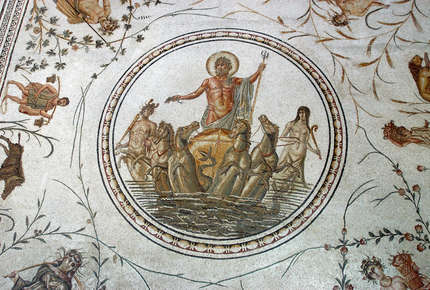 Tour northern Tunisia’s stunning Roman and Arab sites on this in-depth tour. 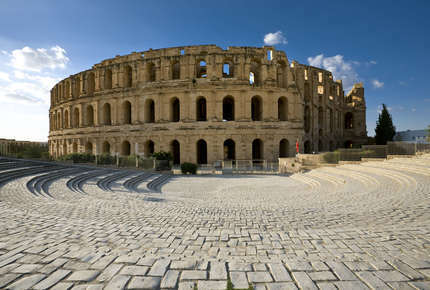 Journey through the olive groves and explore the amazing cultural sites of northern Tunisia.